We want to encourage parents/carers of children and young people with SEND to visit schools, and for schools to be aware of and plan for needs, rather than this be a surprise when the child is allocated directly through the general admissions process. Parents want to know what you offer and provide and may not end up expressing a preference for your school. The SEND Code of Practice 2014/15 sets out what information schools must make available to parents in their SEN Information Report (CoP reference 6.79). Anything that constitutes “less favourable treatment” of a member of a protected group is unlawful. If a parent/carer is told that the school or setting is not appropriate for a child, and this is because of the child’s SEND, then this is unlawful. It’s best to avoid any in depth discussion of the particular child’s needs at these initial visits unless the parent/carer raises this. Subsequent meetings can be planned to discuss this if needed. telling parents that the setting already has too many children with SEND. These can be particularly upsetting, and are always experienced as discrimination. For the admission of children with EHC Plans, schools and settings will be consulted formally in the usual way. Children with SEND who do not have EHC Plans have equal rights of admission, and follow the settings usual admissions process. How do schools know when to have concerns about your child? 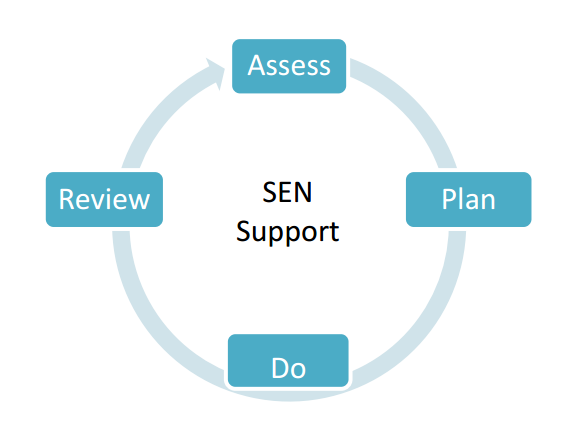 Before identifying a child as needing extra SEN support the class teacher with the school’s SENCo’s (special educational needs coordinator) support will establish a clear overview of the pupils needs. It is not uncommon for pupils to need additional support at some time in their school career. How schools involve parents in deciding what support is needed for their child? Pupils and families now have more of a say in the help and support they feel they need. The new system aims to put each young person and their family at the centre of discussions about the support offered. Parents know their children best and schools should ask parents to share their knowledge about their child, and involve them when planning support so everyone involved can work out what is best for each pupil. Teachers (and where appropriate SENCOs) meeting with parents at least three times throughout the school year. Annual Review meetings for those with Education health and Care Plans. Using Person Centred Planning and approach. Find out more: What is Person Centred Planning? Schools should seek and act upon pupil’s views throughout the year and this should reflect that at the age of 16 young people will also have new rights. When they reach 16, schools should consult Young People directly and their views will be the most significant in a discussion. They can still have support from their parents but the views of the Young Person will take precedence over their parents' views. Children, their parents and young people are involved in discussions and decisions about their individual support and have the information, advice and support they need to enable them to participate in such discussions and decisions. What sort of additional support might my child access? Once the specific areas of need and gaps in learning and development have been identified, additional or different provision targeted at these key area(s) can be planned for. Schools must follow an “Assess, Plan, Do, Review” cycle. This planning process should take place in consultation with the parent and the pupil and should be ‘accurately recorded’. School must have a commitment to providing specialist equipment should it be needed to help a pupil overcome a barrier to learning or accessing the environment. Early Years - Primary: How can children with SEND be supported before and when starting primary school? The ultimate aim of supporting children and young people at school is to ensure they are, wherever possible, appropriately prepared for adult life. What does Hackney as a local authority expect schools to do to support all Hackney’s pupils? Hackney expects all schools to provide an inclusive educational environment for all their pupils. Every teacher is a teacher of every child or young person, including those with special educational needs and disabilities (SEND). All pupils are entitled to high quality, well-planned teaching that caters for their individual learning needs and enables them to participate in a broad and balanced curriculum. Differentiation is defined as: The process by which differences between pupils are accommodated so that all students have the best possible chance of learning. by outcome e.g. setting open-ended tasks and allowing pupil to respond at different levels according to their ability. Ideally all three types of differentiation should be used to accommodate different learning styles within the classroom. “All pupils should have access to a broad and balanced curriculum". 4.1 "set high expectations for every pupil. They should plan stretching work for pupils whose attainment is significantly above the expected standard. They have an even greater obligation to plan lessons for pupils who have low levels of prior attainment or come from disadvantaged backgrounds. Teachers should use appropriate assessment to set targets which are deliberately ambitious and set high expectations for every pupil, whatever their prior attainment. 4.4 "With the right teaching, that recognises their individual needs, many disabled pupils may have little need for additional resources beyond the aids which they use as part of their daily life. Teachers must plan lessons so that these pupils can study every national curriculum subject. Potential areas of difficulty should be identified and addressed at the outset of work." How do schools make sure they are accessible for all students? Accessibility is everybody’s concern and schools are required to produce policies detailing how the school is accessible and how accessibility is going to be improved over time. In Hackney we are fortunate that many of our schools have benefited from the School’s For the Future funding and are newly built with accessibility in mind. For the arrangements within a particular school please see the policy on the school’s own website. Some schools are more accessible than others, e.g. some have lifts allowing easier access to all floors. Supported Childcare Funding - this funding can be allocated to provide resources to support children with significant needs to access childcare and education in universal settings. This funding may be used to purchase equipment, or fund a worker to provide one to one support on a short term basis whilst the child’s needs are being assessed. Assessments should be helpful and provide valuable information about how the curriculum has or could be adapted and which approaches to use in order to meet an individual pupils needs. Schools should undertake the above by applying the “graduated approach”. Schools are expected to have clear systems for identification, assessment, monitoring and securing appropriate support for children with special educational needs. Information on each schools approach to supporting pupils with SEND should be detailed in their schools SEN information report. Schools must involve parents and pupils in a structured and systematic way to shape the support their child or young person receives and to be more transparent about what the school can provide. How are school staff trained and resourced to support my child? It is the responsibility of the whole school to ensure that they understand the needs of all pupils. Awareness: Teaching staff are trained in inclusion and SEND as part of the process of teacher training. Additional training is available and delivered on INSET days to all staff. This can be in school training or training delivered by external professionals. Enhanced: Schools staff who become interested is particular areas of SEND or realise they need specific training to help support particular pupils may develop skills in a specific area of SEND e.g. staff in Autism Resourced Provision at Schools may be trained in a particular approach. Specialist: All SENCOs must achieve the National SENCO Award (NASENCO) within three years of taking up their post. Each school must have an School SEN Information Report on the school or settings own website and available from the schools office, that provides greater detail on how they approach supporting children with SEND including what training staff have. This may have previously been referred to as a school local offer or SEN Offer but the Department for Education are very clear it is now to be called an SEN Information Report. School SEN Information Reports are different from a schools SEN Policy. They are written for parents and should avoid jargon, acronyms and terminology that may be unfamiliar or unhelpful for parents/carers. Children with EHCPs in place receive allocated funding specific to their level of need through Hackney Learning Trust. This is in addition to the funding schools receive in their delegated budgets for pupils with SEN. Element 2 SEN Support funding extends up to £6,000. Schools should ensure the training needs of staff are identified alongside children’s needs. Schools SENCOs are expected to work with relevant agencies to organise and deliver appropriate training for identified staff. Schools should ensure they maintain and develop the quality of their teaching and provision to respond to the strengths and needs of all pupils. School staff are encouraged to undertake training and development, as part of their continuing professional development (CPD). School SENCOs can keep up to date with borough wide, regional and national development relating to SEND by attending Hackney Learning Trust network meetings e.g. SENCO conference and SENCO forum. Hackney's School Improvement Partner (SIP) Programme is currently being used in Hackney schools and further afield across England. It offers a programme of school visits to support school leaders to evaluate the impact of their school’s work. Each school taking part will have an allocated Leadership and Management Adviser (LaMA) to work with school leaders throughout the school year. They should be helpful and provide valuable information about how the curriculum could be adapted and which approaches to use in order to meet an individual pupils needs. Schools must involve parents in a structured and systematic way to shape the support their child receives and to be transparent about what the school can provide. All schools should be aware of the borough’s Accessibility Strategy. A child’s disability or SEND should not prevent them from taking part in extracurricular activities or school trips. Find out more: How does Hackney assist pupils with SEND to access schools and the National Curriculum? Risk Assessments for all off-site visits should are completed and approved by the Headteacher or a member or the senior leadership team and copies kept electronically and in hard copy format in the school's office. Where necessary individual risk assessments can be completed, to help plan for children’s individual needs. Risk Assessments should reference the provisions for children with additional needs (including medical needs, allergies and SEND) they should also include an evaluation section for review and improvement purposes. More information about the individual arrangements in schools can be found in their Accessibility Policy available from each school’s website or school office. What if a child’s difficulties are emotional difficulties? Schools have individual arrangements for supporting children experiencing emotional difficulties. Maintained schools, Academies and Free Schools have a link Educational Psychologist/EP from Hackney Learning Trust’s EP service via a core offer, and additional support can be brought in as necessary through the traded services arrangement. SENCOs seek external advice from EPs where there are concerns about a particular child with permission from parents. EPs also attend Multi Agency Planning meetings where concerns may be raised that could lead to a referral being suggested. Schools will have individual internal structures to support their students. Some have learning mentors trained to support children generally and in specific circumstances like bereavement. Information about specific arrangements can be found in the schools SEN information report. Hackney Learning Trust’s Educational Psychology Service has professionals specifically trained to provide support to schools in response to traumatic incidents. Schools can also make referrals to mental health services that can provide short term or longer term support. Bullying is not acceptable in any situation; at school, within a group of friends or online. Schools should reassure children that they will be listened to and that their concerns will be taken seriously and acted upon. Schools should make clear how children and young people can talk to someone in confidence. All schools must have a policy on how bullying is dealt with available from their website or from the schools office. Useful information and resources about being safe and bullying can be found on Hackney’s Local Offer website.